Meet Woodfin, the playful, kaleidoscopic chameleon who is able to turn all the colors of the rainbow, as well as plaid and polka-dot! Even though Woodfin sometimes gets into trouble, he always learns a positive lesson from every new experience. Through his adventures, he learns the greatest lesson - that being himself is what’s really important. see -- that is, if you can find him! 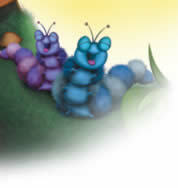 Look for Woodfin hidden in the leafy borders surrounding each page! Would you believe that Woodfin the kaleidoscopic chameleon was actually born without any color at all?! Come join the adventure as Clipper, the Chatterpillars and Davis the Giraffe all learn about Woodfin's amazing talent. Look closely to find Woodfin peeking out at you in the leafy border of each double-page spread, too! Size: 8 1/4" x 10 1/4"